There has been no shortage of interesting twists to come out of the power metal world of late, but if there is one that made a respectable studio outing in 2018 that takes the cake, it would be the rather curious stylistic merger off epic heavy metal barbarism with a amazonian queen at the fore and a power metal gloss to boot in Romania’s Scarlet Aura. As best as it can be described, this outfit deals in a sort of exaggerated grit and grandeur hybrid sound that marries the flamboyant Doro Pesch on steroids sound typified in the front women of such popular American metal outfits as Unleash The Archers and the recently defunct Huntress with a keyboard-rich backdrop and Euro-tilted atmosphere that wouldn’t be out of place on a number of German and Swedish power metal outfits. Their resulting sophomore LP Hot’N’Heavy carries a name that would more readily be associated with a band dealing in the debauchery typified in a Twisted Sister or W.A.S.P. outing, and though stylistically there are some elements of those older school bands at play here, this album runs along more the lines of hot and heavy signifying the sort of metal that a blacksmith works with when forging weapons for Red Sonja. The principle attraction of this outfit is clearly vocalist Aura Danciulescu, who has all the makings of a youthful successor to the throne that was originally established by Doro during the heyday of Warlock. She possesses maybe a slightly greater level of gravely grit to her voice, which comes off like she’s recently come off a massive cigarette and beer binge that would have put the Cycle Sluts From Hell into a 3 week coma, but ultimately finds herself in a musical context that is befitting of a Warlock disciple. The music that surrounds her is a bit less bound by the Judas Priest meets 80s glam orthodoxy that largely enveloped the mid-80s Warlock sound, though there are individual songs that listen very close to that older model. The general feel here is on the epic side of the equation and leans a bit towards a Manowar-like sound with a greater keyboard presence, perhaps comparing best to a band like Sonic Prophecy for a recent example. Nevertheless, there are moments where things go off in a totally different direction, such as the chunky blues-driven Sabbath character of the title song “Hot’N’Heavy”, or the stomping heavy metal groove machine with a Warlock melodic flavor “You Bite Me, I Bite You Back”. Though the singer who’s name is included in the band’s title is a tough quantity to avoid dwelling upon, there is also a very healthy contribution to this by guitarist Mihai Danciulescu. His riffing style cycles through a fairly elaborate array of influences from Tony Iommi, through David Shankle, all the way over to the likes of Manilla Road’s now sadly departed band leader and axe man Mark Shelton. He showcases a particularly elaborate assortment of old school heavy metal and Helloween-oriented speed metal riffing goodness on the heroic anthems “In The Name Of My Pain” and “Silver City”, whereas his contributions on “Hail To You!” and the driving closer of an epic “To New Horizons” go into full on power metal mode and feature the metal-worship and posturing give way to something more along the lines of fantasy-based storytelling. For the most part, Mihai’s guitar soloing retains more of an 80s shredding vibe, avoiding the excessive sweep-picking and overt Neo-classicism for more of a straightforward shredding assault, often employing the wah-pedal sound that was sort of done to death by Kirk Hammett, but more often with the needed nuance to keep the solos from turning into monolithic venting sessions. This is probably most directly geared towards fans of retro-80s heavy metal, touching every modern offshoot from the Manowar-obsessed epic metal crowd to the amazonian, attitude-based brand that has seen varying waves of popularity in the U.S. over the past seven or eight years. It’s no slouch in the technical department, nor does it go overboard on the showmanship and keeps things well centered on memorable songwriting and a ballsy metallic presentation. Back at the turn of the millennium there was a small wave of a bands who attempted to realize this sort of feminist ideal in the power metal world, one of its biggest failures being the much maligned (rightly so) and short-lived Italian outfit Power Symphony, and a full 18 years following their sophomore flop Lightbringer, this outfit basically took what they were going for and actually did something highly listenable with it, in no small part due to having a vocalist who can actually sing in tune and not sound like a dying goat when trying to put some edge on her voice. Lyrically and stylistically it’s a bit all over the place, but there are no glaring weaknesses to be found on this modern yet retro synthesis of epic metal and 80s rock. 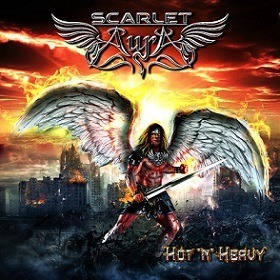 This entry was posted in Hard Rock, Heavy Metal, Power Metal, Reviews and tagged Bucharest, Doro, hard rock, Heavy Metal, Hot'n'Heavy, Lita Ford, power metal, romania, Scarlet Aura, symphonic.